There's nothing worse than when your dog gets a hold of shoes, children's toys and stuffed animals, and even the worst case scenario: toilet paper. Teach your dog to chew on more appropriate items - like this LK9 teeth cleaning dog toy instead! 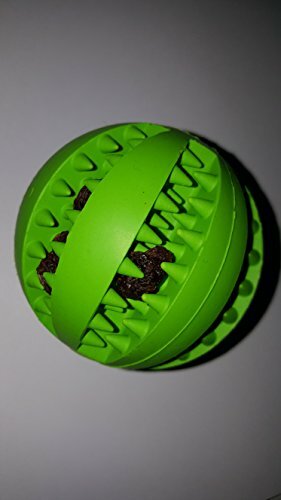 Reputed in tests to keep great chewers going for a while, the LK9 Dog Ball Toy is made of natural rubber with interlocking sectors so that it easily absorbs and dissipates the force of your dog's bite. Features: Lots of interlocking teeth between sectors provide secure hold for treats and food for your dog to tease out; teeth also help massage gums as your dog digs into the sectors - definitely a great present for your dog. Durability Design: The LK9 dental training rubber ball has been designed to be durable and is one of the most durable products in this category for dogs. This is because of its design. It has 8 sectors that gives many options for the product to continue to function as a working whole. So even if your lovable beast were to eventually rip through a sector, the product still maintains its function and purpose with the other sectors. Benefits: With its vibrant, bouncy flexibility, the LK9 ball will bring much joy and rest to your pet and the household. Your dog will get hours of enjoyment and excitement out of it. Furthermore, it is the ideal dental exercise toy for your dog as it provides a soft, chewy but resistant surface. Your dog will get the benefits of healthy teeth and gums as well as entertainment and occupation. The all-in-one dog toy is here! Add one to your cart today. Customer Service We want you to have a great experience. Please contact us with any queries. Safety: Not to be ingested. Please monitor use. 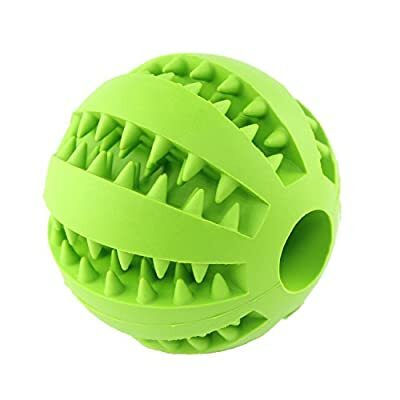 Amazing Bite-Resistant Dental Training Dog Ball Toy - Flexible Natural Rubber •Contents of pack: 1 x LK9 dog ball toy. DURABLE, PLIABLE and SAFE MATERIAL: the product is made of natural bite resistant and non-toxic rubber, with interlocking sectors to provide good elasticity, durability and harmless to your pets •CREATIVE Use: the design of the ball is such that it is chewable, gentle on your dog's teeth while absorbing the force of the bite and dissipating it across all sectors. This keeps it a curious fascination for your pets and provides plenty of good and safe dental exercise for your dog, helping to build strong teeth and provide teeth cleaning. • All these attributes come together in the LK9 Dog Ball, designed with the health of your dog in mind. The LK9 is great for use in the park to play Fetch, strengthening the bond between you and aiding more cognitive interaction. The loud colours attract your pet's interest and keep them occupied for hours on end with the ball. This is especially useful for very boisterous and adventurous dogs. • At P-A-B, we understand that your journey is far sweeter when travelled with your dog and we know that YOU DO CARE. That is why we make special effort to support you on that journey with care, focus and attention to detail - just like your dog deserves. We continually strive to provide customer satisfaction with great quality products at fair prices.